I’m no freegan (or as my Dad would say, dumpster diver), but banana bread is my favorite celebration of letting as little as possible go to waste. When you’ve forgotten to hit Chiquita up fast enough and your bananas have gone from yellow to brown (or black, even! ), that’s when you need to pull out this recipe. Banana bread is not only exceptional with old bananas, it truly can ONLY be made with old bananas. So next time you’re thinking about tossing those seemingly junky bunches, save them for this delicious treat. 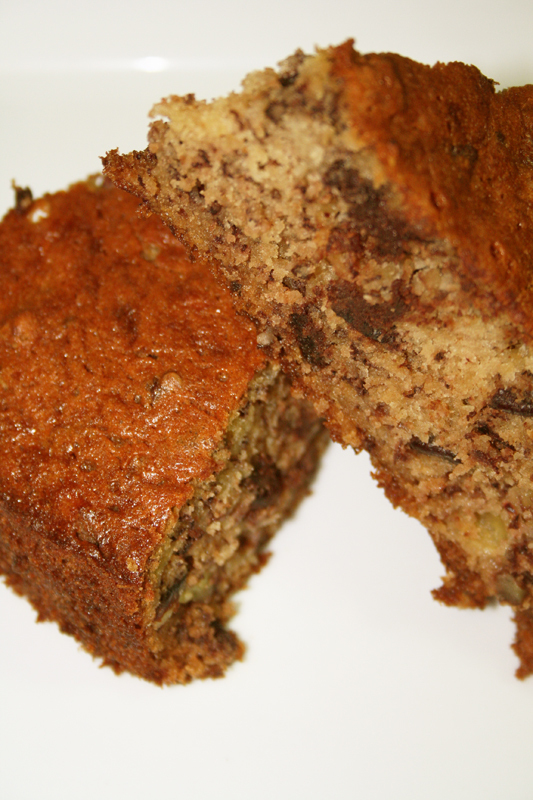 Banana bread is certainly a morning treat, and has a reputation for being a nutritious breakfast. This is not that banana bread. Gooey dark chocolate and crunchy pecans are mixed into the rich, buttery batter. I make this bread when I’m looking for something slightly sweet for dessert – it’s still light like banana bread, but the chocolate just takes it to another level. Don’t skimp on the chocolate, by the way – the finer the cocoa content, the better. I like the Lindt bars with 60% cocoa, broken into pieces. If you’ve only got chips in the house, though, you can certainly use them. Just try to buy good ones, like Ghiradelli. Preheat oven to 350°. Mash the bananas in a bowl. Mix in the eggs, vanilla and softened butter. Sift in the sugar, flour, baking soda and salt. Fold to incorporate dry ingredients into the wet. Mix in pecans and chocolate. Butter a 9x5x3 pan and turn out the batter into the pan. Place in the oven and cook for 55 minutes. Let cool and slice into squares.